We never knew anything about my husband’s grandfather Walter Dance, and the only answer to any question was “he was an English Orphan who abandoned the family years ago”. No one in the family ever talked about him it was like he had never existed. In 1999 when my husband’s father died, we thought that any opportunity to know something had probably died with him. But later on, going through old family papers three important items came to light – a book titled “The Little Immigrants” – The orphans who came to Canada by Kenneth Bagnell, next a letter postmarked England in 1918 signed your loving sister Ada, and lastly a certified true copy of a birth certificate for Walter listing his parents, his father’s occupation and where in London he was born. After reading “the little Immigrants”, I decided that I would send an application to Barnardo’s enquiring about a Walter Henry Dance. An immediate response confirmed that Walter was a Barnardo boy. Then five months later a fat envelope arrived with a wealth of information about his family in England as well as dates of his arrival in Canada, the family he resided with and worked for, as well as annual personal inspection reports on his health, development and welfare. The Barnardos file and pictures together with birth, death and marriage certificates of Dance family members listed in that file and obtained on a 2005 trip to England helped us piece together Walter’s family in England and why his life was in Canada. It also eventually helped us meet Dance family descendants in 2010. Walter Henry Dance was born Mar. 17, 1887 at 43 Rockingham St., Newington, London, England. His father was George William Dance (a Grocers assistant) and mother Mary Ann Minter. At the time of his birth, he had an older brother and sister, William and Ada, twins aged 9 years as well as a sister Edith Annie aged 3. Another sister Emily Ellen was born in 1893. 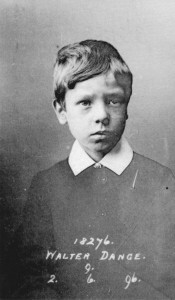 Less than three months after his father died on March 14, 1896, Walter now aged 9, was admitted as a student to Barnardo’s Leopold House in London. His elder brother and sister now aged 17 were both in service. There were two sisters at home, Edith aged 12 and Ellen aged 3. Ellen was afflicted with enlargement of the brain and the mother Mary Ann was in very poor health and could not look after all of them. While there were many maternal and paternal relatives listed in the report, it would seem that none could take him into their homes. This must have put quite a strain on the newly widowed Mary Ann and thus she decided that Barnardo’s School for Boys might save her son from running wild in the streets. Walter received a good start to his education during his 15 months at Leopold House. Early in 1897, brother William enlisted with the Essex regiment for a better life. And on May 9th, 1897, Walter’s eldest sister Ada (twin to William) married George James Taylor. Could this be a home for Walter now, with family? But Mary Ann must have decided that Walter should have an opportunity for a better life in Canada, because on September 23, 1897 he sailed to Canada on board the SS Labrador. He arrived in Quebec on Oct. 2nd and then arrived at the Winnipeg Branch House on Oct. 25th. He stayed in Manitoba until Dec. 2nd, when he was assigned to a Mr. Wm. N. Stiles in Innisfail, The Territories of Alberta. He traveled on the CPR for each leg of his journey in Canada. He arrived at the train station in Innisfail on Dec. 6th, 1897 to be met by Mr. Stiles. “boy who done first rate for a while will not hardly do anything. Will not cut a stick unless watched and although treated with every kindness, threatens to run away”. Walter’s mother had died on November 29th, 1897. We wonder if the sad news had just caught up with him and he realized fully that he would never see her or any of his family again. At first there is a note in the Barnardo’s file indicating that Walter may have to return to England. But on Feb. 18, 1898, Mr. Stiles writes that he has procured a new situation for Walter with Mr. James Brown and wife Mary also of Innisfail. Articles of Agreement were drawn up and agreed to by Mr. James Brown. This agreement was for board, lodging, washing and necessities to April 1, 1903, with 2 terms of nine months of school in each year. At the end of the contract $100 would be payable to Walter. Mr. Brown has been noted in the history of Innisfail “Candlelight Years” as raising good horse stock. The Barnardo reports record Walter as “likely to do well and is a remarkable fine horseman, and is able to handle any animal on a ranch”. Thanks no doubt to Mr. Brown. In April of 1903, correspondence to Barnardo’s indicate that Walter (now age 15) wished to have his $100 in wages paid directly to him rather than sent to Barnardo’s first. Walter wished to invest in cattle and “put them out on shares”. Mr. Brown approved this plan and Barnardo’s agreed. Walter had also re-engaged with Mr. Brown for 6 more months at $10 per month. In October, Walter writes to Barnardo’s to advise he “has given Mr. Brown his receipt for the funds paid him. He expresses thanks for the medal awarded to him”. Correspondence between Barnardo’s, Walter and Mr. Brown show that Walter leaves Mr. Brown in October of 1903, returns in June of 1904 and then leaves again in December of 1904 but continues to visit quite often. Walter also is said to be “working with a Hay pressing gang and getting along very well”. He continued to be in touch with the Brown family for a long time. In late 1905, a letter from Walter to Barnardo’s indicates that the Mistress of the place he is now working is looking for another boy. 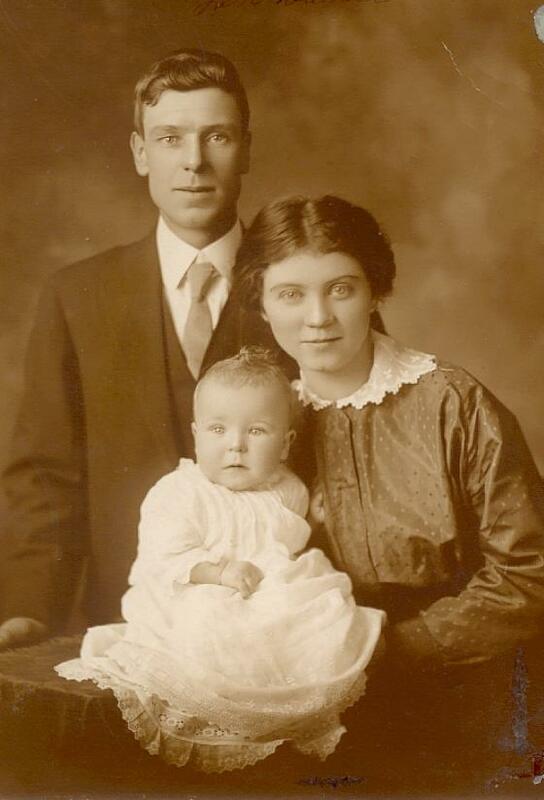 We believe this might be Joseph and Mildred Simmonds, as we find Walter with them in the 1906 census. Walter still maintains his postal address as Innisfail, Alberta. While the next few years are blank, we find Walter crossing the border in 1909 and going to Spokane. The US 1910 census shows a Walter Dance in a Yakima boarding house working for the railroad. While we do not know where or how Walter met Laura May, we have a New Year Letter Card postmarked from Calgary, Dec. 24th, 1910? adressed to Laura Latam in Red Deer, signed from Walter. So they knew each other for a while before marriage and we can only guess that he may have met her while working on farms up and down the CPR corridor between Red Deer and Calgary. In August of 1915, a son Walter Leonard (known as Len) was born to Walter and Laura May in Calgary, Alberta. They were residing at 116 – 9th St., N.E. Calgary, Alberta. We have been to the address and that entire block has been rebuilt. However the next block has not been touched, and looks much like it might have back then. We think the family remained in Calgary for a few years as we have a postcard from Laura’s brother John Wesley Latam, while serving in France during WW1 with the CEF. Around this time a letter to the family dated March, 1918 and signed “your loving sister Ada” provides us with a look back at one of the family members in England. Ada tells of the rationing and of having 3 daughters and one son who was wounded in France. She also notes that another sister Edith has been visiting one of Laura May’s brothers who had been wounded and in hospital in London. Ada also states that she has not heard from her twin brother “Will” for a very long time. This was not a good sign. About 1919 we think that Walter was in the garage business in Bowden, Alberta. It was here that a second son Garfield was born November 16th, 1919 and died Jan 7th, 1920. We found confirmation in copies of the “Innisfail Province” held in the museum archives at Innisfail. They also spent some time in Bassano as we have the birth certificate of a third son being born. This was William Melvin Dance (known as Melvin) born March 3, 1921. Again there is a gap of years, but we have some indication that they lived in Spokane in 1924 and 1925. We found Walter listed in the city directory and working for the railroad. When Laura May receives the news that her mother is ill, the family packs up and moves back to Alberta about 1927 settling in Bremner. It is here that Walter operated a garage at the SE corner of Hwy 16 and Hwy 21. The building used was a former school moved there. This area is now a cloverleaf where the roads meet. Bremner was also the residence of Laura May’s father Francis Melbourne Latam and many of her siblings. Francis was once the Bremner storekeeper and mailman. Many of the Latam family are buried in the Clover Bar Cemetery. It is in Bremner that Len and Melvin went to school. Melvin died in Bremner, sometime in 1932 aged 11. His grave marker is also in the Clover Bar Cemetery. In December of 1935, Walter leaves Bremner and begins a long drive to Vancouver, BC. He drives south through Calgary, then over to Spokane, on through the Snoqualmie Pass to Seattle and then he reaches Vancouver on December 29th. This is quite an undertaking especially in December. He spent Christmas in Spokane with friends. In the summer of 1936, Len (now 21 years) and his mother Laura May drove to Vancouver taking the same route with a stopover in Spokane, but in much nicer weather to join up with Walter. The family is together again. Walter and Len had some land in south Langley, BC just off the Brown Rd. where they raised chickens and sold eggs. Laura May was a live-in housekeeper at a large home in the Fort Langley area. One morning sometime in late 1937, Walter drove into Vancouver to sell the surplus eggs and never came home. A few days later, a letter arrived for Len indicating where the car was parked and enclosing the keys. Walter did not say where he was going or when he would be back. To the best of our knowledge, he was never seen or heard from again by any family members. No one knows what happened. So from nothing, we now have a more complete picture of his life, both the sad and happy moments as with all families. We have a number of wonderful pictures of a very handsome man with very sad eyes. Walter Dance did not appear in the Library and Archives Canada Home Children pages until about 2013, when I submitted the Barnardo’s information and passenger list. There was a number of Walter’s with no last name and a Walter Dunce – both of the same age. The record is now corrected and you will find him when you search. While Walter’s story ends here, we have found descendants of the brother William Dance who was killed in WW1, and in 2010 were able to meet a member of the family and again in 2014 meet others. We remain in touch. Thank you for your story on Walter Dance. I enjoyed it very much. Just finished reading your story Marlene Dance – quite a story with lots of detail and records of events along the way, everything going along nicely until the shock ending. Wow so heartbreaking. I would imagine you have tried every means to find Walter’s final resting place and I would imagine there would not be a gravestone to find making this a very difficult search. Do you care to elaborate on this – were there any clues at all for you to follow-up on? Somehow I don’t think so, but very happy you met up with other family members. We have come to believe that the sadness in Walter’s life finally overwhelmed him. His son was grown up, his wife was living away from them for her work and he probably could see no prospects for ever going back to England to see family. We have done extensive searches for a death record in BC, Alberta, Washington and Idaho. Nothing has shown up. We have checked cemetery records in all those areas as well. We are presently following up on all the “unknown” death records in BC but nothing yet. I wrote the story both to show how much you can find in the records to piece together a life and as a tribute to a man who I believe tried his best but struggled with the life he was dealt. Thank you for your report. I am about to follow a similar path to find the family background for my great grandfather Thomas Lawson who arrived at Quebec on 16 May 1870. Can you see this now? it was posted twice in error. Sorry. Interesting read. My BHC grandmother abandoned her first family including 2 very young children and then went on to have 4 more children with her common-law husband. She went to great lengths to remain hidden. It took a lot of work on my part to find her. Wonder if their experiences led to their leaving their families? A sort of post tramatic disorder or sorts. Marlene, great to see this story in print. Your diligence was remarkably rewarded; so sad the ending is a mystery.